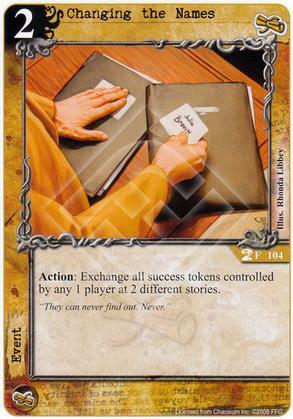 Flavor Text: They can never find out. Never. An exchange must involve two entities that are changing their status or position. If one of the entities is absent or cannot be changed, the exchange attempt fails. Action can be triggered before or after all stories resolve. Cannot be triggered inbetween stories. This is marked as a 'scientist'...?